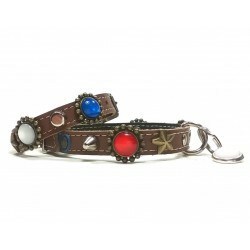 Fancy Dog Collar and Bracelet with Red White and Blue Polaris Stones. Together with the nice charm it is an attractive design. You don´t have to be French or Dutch to like it. It is simply a great combination of colors. 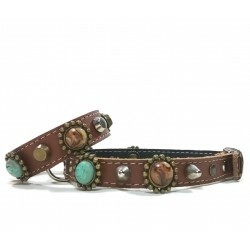 You and your dog will look great! 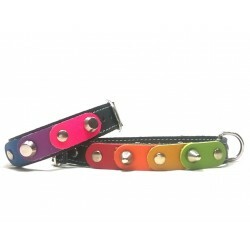 This collar for Chihuahuas and small dogs and the bracelet is decorated with pretty pink and fuchsia leather patches and rivets. 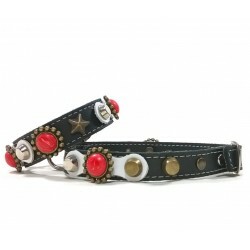 This leather collar for small dogs and Fit bracelet with studs and red coral stones style Polaris They are both is cool and look trendy! 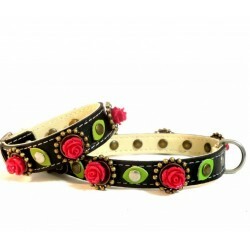 An original small collar and bracelet with beautiful red roses in ornaments and green leather leaves on black leather. 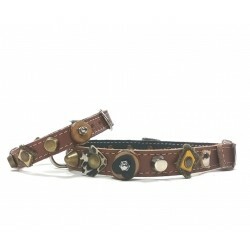 Your dog and you become famous with this design!